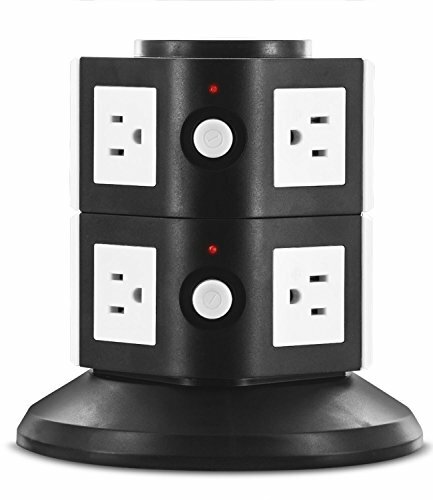 The Aduro® Surge Power Tower is an innovative way of organizing your power devices around your home and office. It not only gives you maximum usability of the sockets provided, but also provides direct and fast USB charging ports for you smart devices, such as Smart Phones and Tablets. All Sockets/USB ports are grounded and provide overload protection. Premium quality circuitry and professional quality fire-retardant material ensure life-time safety and reliability. Each charge station block features an individual ON/OFF switch. Each USB charging port can charge any device at full speed - no need to decide between them as long as your device's input current and voltage falls within the accepted range (5V/0.1 to 2.1A). World Famous Warranty At Aduro, we believe in our products. That's why we back them all with a LIFETIME warranty and provide friendly, easy-to-reach support.